Elon Musk's SpaceX has pushed back its launch of a mysterious satellite for the U.S. intelligence community because of a sensor issue. Liftoff, which was scheduled for Sunday morning, is now slated for Monday at 7 a.m. ET from the Kennedy Space Center in Cape Canaveral, Florida. The launch was scrubbed Sunday with just 52 seconds left in the countdown. SpaceX lead mechanical design engineer John Federspiel, who hosted the company's webcast, said the SpaceX team decided to halt the launch "out of an abundance of caution" after noticing an issue with a sensor on the first-stage rocket booster. The customer for this launch is the National Reconnaissance Office -- a U.S. government agency that develops and maintains spy satellites. The NRO says it surveys potential threats to the United States by tracking terrorists and monitoring the development of nuclear weapons in other countries. It can also provide an early warning of a potential missile strike. The payload for the Monday launch, which is being referred to as NROL-76, is classified. SpaceX shared no details on what type of surveillance the device will perform, how large it is or where in orbit it will be delivered. Sometime next year, SpaceX is scheduled to deliver GPS satellites into orbit for the Air Force. Musk has fought hard to win launch contracts with the U.S. government. Boeing (BA) and Lockheed Martin's (LMT) United Launch Alliance previously held a lock on that business, and Musk filed a lawsuit against the government in 2014 for the right to bid for military contracts. NASA is a longtime SpaceX customer. The company has conducted nine resupply missions to the International Space Station under NASA contracts since 2012. Monday's launch is the first for SpaceX since the historic SES-10 mission last month. 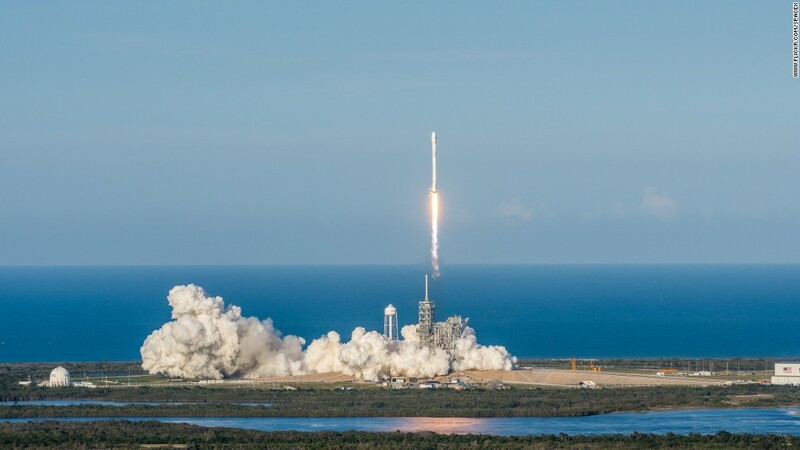 That mission marked the first time SpaceX launched a used first-stage rocket booster toward orbital space -- marking a huge leap toward reaching SpaceX's goal of drastically reducing the price of spaceflight. The ability to reuse rockets is key. The most expensive portion of SpaceX's Falcon 9 -- which has a sticker price of $62 million -- is the first-stage booster, which accounts for up to 70% of the cost, according to Musk. SpaceX will use a new rocket in Monday's mission. But the company has plans to launch as many as six more missions with used rockets this year. And SpaceX will attempt to recover the first-stage booster after Monday's launch, setting up that rocket to potentially complete another mission in the future.